Most people know, but few believe, that I was a vegetarian for 11 years. I have no regrets. What started as an act of pre-adolescent self-rightiousness turned into a decade-long stint. It left me with a deep appreciation of weird, gnarled tubers and difficult squash, as well as a persistent, daily craving for bitter leafy greens. When I moved to France (an act that effectively ended my vegetarianism), I took with me only two cookbooks: The Paris Cookbook by Patricia Wells and Vegetarian Cooking for Everyone by Deborah Madison. Wells’s book was a huge influence on me; it became my neighborhood guidebook, as many of her featured haunts were less than a few meters from my apartment in St-Germain-des-Près. However, it was Madison’s book that became my daily go-to, a constant source of information and inspiration. She showed me what to do with and how to eat so many of the things that I saw in the markets and had never prepared before. Over the years, I think that I have cooked almost every recipe in the book. If you do every recipe in any cookbook, you start to feel a real intimacy with the cookbook author. Madison was a great teacher. I credit my food fearlessness, not to the hip, new restaurant du jour serving liver and brains, but to Madison. Rutabaga? Bring it on. Kohlrabi? Yeah, baby! Celeriac? Love it! Another thing Madison taught me? Recipes are great to follow, terrific for ideas, but ultimately you have to find your own style. Now when I turn to her book — or any book for that matter — I feel confident to change it up, switch things around, and adjust it to my taste. This recipe is originally from Vegetarian Cooking for Everyone, but of course, I’ve played with it a little bit. 1. Cut the tops off each stem of broccoli and divide the tops up into small florets. Using a vegetable peeler, peel the stems. Cut the stems into bite-sized pieces, roughly the same size as the florets. 2. Boil the pasta in a large pot of salted water. 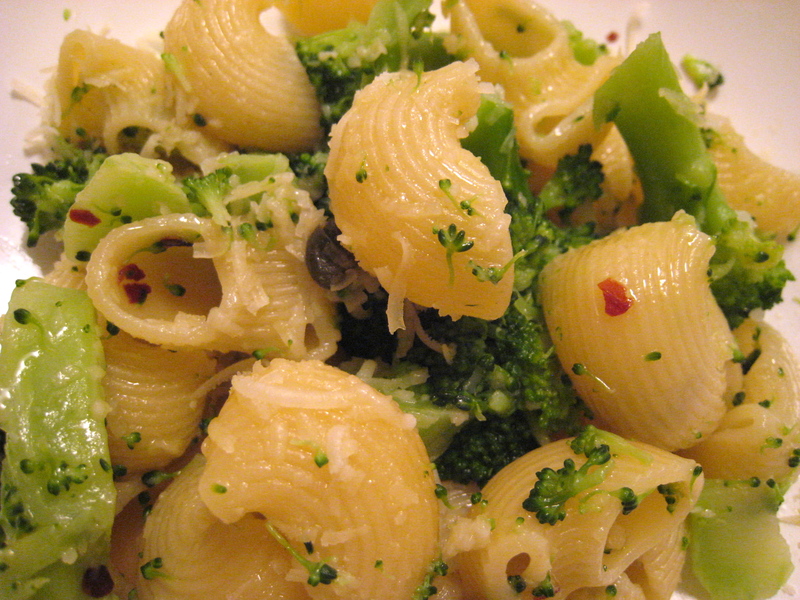 When the pasta is half-way cooked (about 5 minutes), add the broccoli florets and stems. Continue to cook, uncovered, until the pasta is al dente. Drain the pasta and broccoli into a large colander and wipe out the pot. 3. Heat the oil, garlic, and capers over medium heat until fragrant. Add as little or as many red pepper flakes as you like (I like a lot). Sizzle the red pepper flakes in the hot oil for a few seconds, being careful not to let them burn. Add the pasta and broccoli back to the pot with the lemon juice. Toss everything together well. 4. Turn off the heat and transfer everything to a large warmed bowl. Shower the pasta with freshly grated Parmesan and serve immediately.